Composite map of various branches of the flow in the Chukchi Sea and along the slope. Stabeno, P., N. Kachel, C. Ladd, and R. Woodgate (2018): Flow patterns in the eastern Chukchi Sea: 2010–2015. J. Geophys. Res., 123(2), 1177–1195, doi:10.1002/2017JC013135. This paper describes currents in the Chukchi Sea and their relationship to ice and winds. The Chukchi Sea consists of a broad shallow shelf, extending more than 800 km northward from its southern boundary at Bering Strait to the shelf break bounding the Arctic basin. The primary source of water to this shelf is Bering Strait, and much of the flow exits the Chukchi shelf through two canyons—Barrow in the east and Herald in the west. The inflow of Pacific water through Bering Strait provides heat, freshwater, salt, and nutrients to the Arctic Ocean via the Chukchi shelf. From 2010 to 2015, moorings were deployed on the northern Chukchi Sea at nine sites. Deployment duration varied from five years at a site off Icy Cape, Alaska, to one year at a site north of Hanna Shoal. In addition, 39 satellite-tracked drifters were deployed in the region during 2012–2015. The water volume transport near Icy Cape was approximately 40% of flow through Bering Strait and varied seasonally, accounting for more than 50% of summer and approximately 20% of winter transport in Bering Strait. Current direction was strongly influenced by bathymetry, with northward flow through the Central Channel and eastward flow south of Hanna Shoal (see figure). The latter joined the coastal flow exiting the shelf via Barrow Canyon. The trajectories of the satellite-tracked drifters can provide information on general flow patterns. 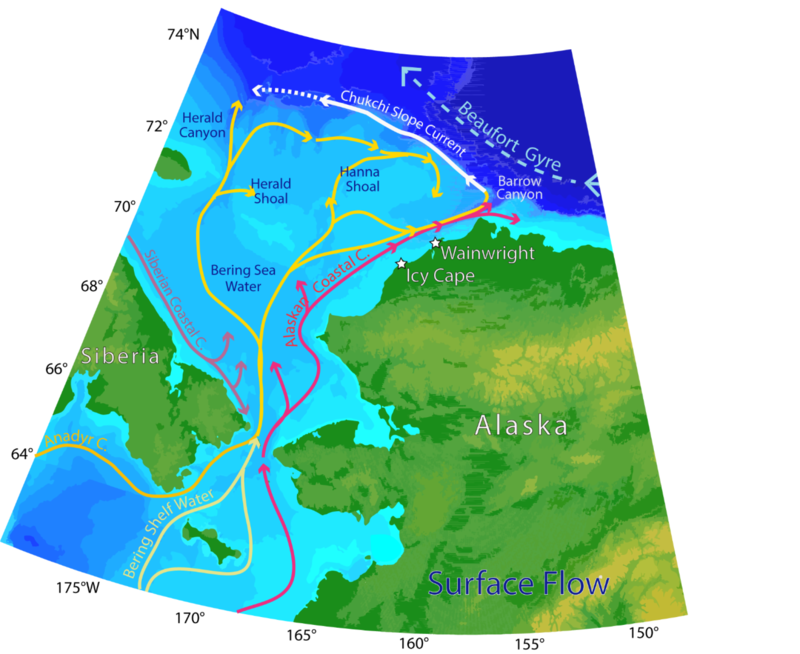 The drifter trajectories indicated a transit time of approximately 90 days from Bering Strait to the mouth of Barrow Canyon during the ice-free season. Approximately 70% of the drifters turned westward at the mouth of Barrow Canyon and continued westward, along the slope in the Chukchi Slope Current (which may, based on drifter trajectories, extend as far west as the mouth of Herald Canyon). This slope flow was largely confined to the upper 300 m, and although it existed year-round, it was strongest in spring and summer when sea ice was limited. For more information or to read the full article, visit the publisher's article page here.